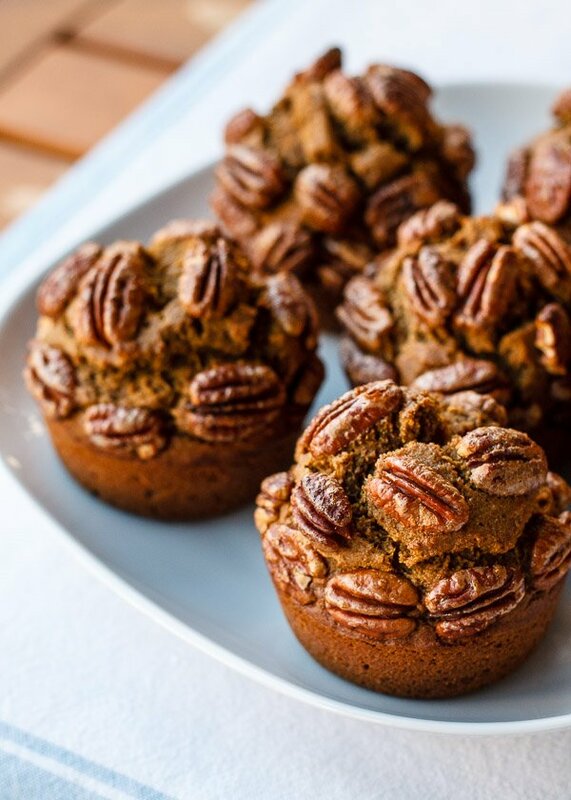 These muffins are made with teff flour, a super nutritious little grain, and covered in crunchy maple pecans, with an almost custard-like crumb that makes them taste like sweet potato pie in a muffin. I don’t know the shelf-life of these muffins because I got a text the day after I made them saying “P.S. I ate all the muffins.” But you know what, that’s okay because they’re good to the grain! I literally have negative 5 minutes to share this recipe with you, in between my flight back to Boston last night and my outgoing flight to Greece tonight (yep, I’m going to Athens!! ), so let’s get at it. 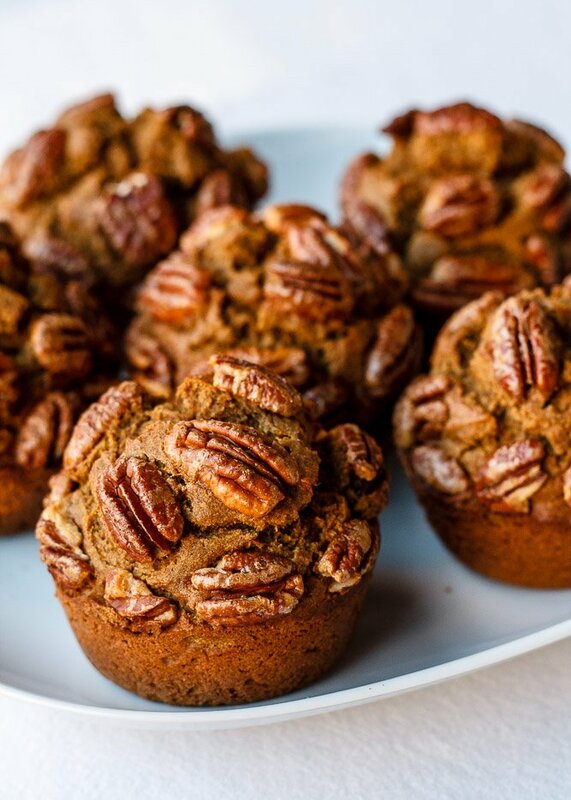 These muffins are part of my low sugar baking series where I replace part of the sugar with a sweet fruit, root, or squash puree, adding not only natural sweetness but also fiber, nutrients, and deliciously unique flavors. Topped with crunchy pecans, the texture contrast is on point too. A mighty important note about baking with teff flour in case you want to start using it in other recipes – it is super absorbent. I’m only using 3/4 of a cup in this recipe along with some almond flour, so a little goes a long way! Use orange or yellow sweet potatoes. Don't use Asian white sweet potatoes - they're too dry for this recipe! I use Bob's Red Mill Teff Flour. The nutrition label says 1/4 cup equals 40 grams. That means 1 cup is 160 grams. However, the King Arthur Flour website says 1 cup of teff flour weighs only 135 grams! The only thing I can think of to explain the discrepancy is that the heavier measurement was achieved with unsifted flour using the scoop and sweet method, and the lighter measurement came from sifted flour. So please measure your teff flour by weight if possible. If you don't have a scale, do not sift your flour for this recipe. Simply dip your measuring cup into the bag of teff flour (or pour the flour into the cup) and level the top with the back of a butter knife. Generously grease a muffin pan with coconut oil. Mix mashed sweet potato, sugar, maple syrup, vanilla, eggs, and coconut oil/butter until smooth. Add almond meal and mix until fully incorporated. Whisk teff flour, baking powder, cinnamon, salt, and freshly ground black pepper in a separate bowl. Beat the dry mix into the wet mix until there are no lumps. The batter should be thick and fluffy. In a separate bowl, toss pecans with maple syrup until well coated. Plop the batter into the muffin pan with a 1/4 cup measuring cup, two times for each muffin, and don't flatten or smooth down the batter if you want rounded muffin tops! Scrape out any remaining batter and distribute evenly. 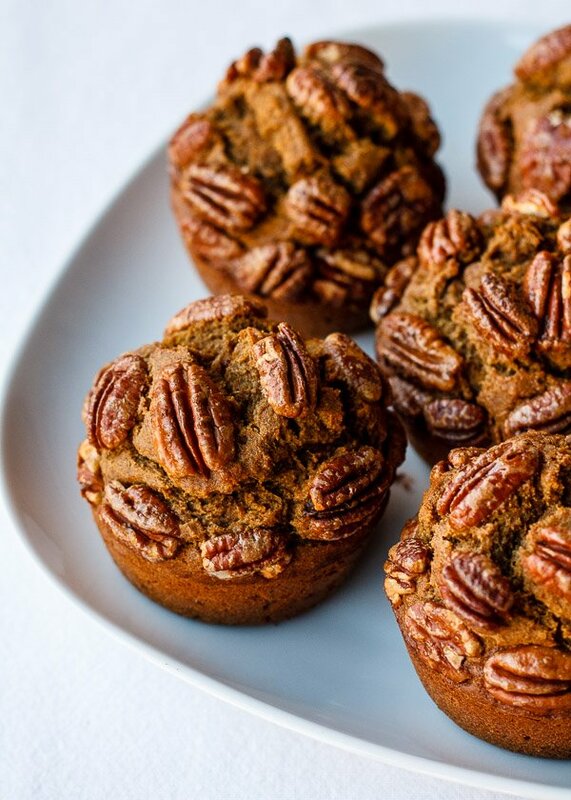 Gently press in the pecans, and bake for 25-30 minutes, rotating halfway through, until a toothpick inserted in the center of a muffin comes out clean. Let pan cool for 5 minutes, then remove the muffins. Eat warm or let cool completely before storing. The pecans are crunchiest on the first day. Bake at 350° F for 10 minutes to reheat. As with many gluten-free (and even gluten-full) baked goods, the texture is best when toasted and warm. EXCELLENT recipe!!! I have been searching for recipes with teff flour and this one is the best. Thank you so much! I’ve heard good things about sunflower seeds as an alternative to nuts in recipes. You could try grinding them in a high speed blender or food processor. Of course the taste will be a little different, but I hope you have success experimenting! Hi, this recipe sounds and looks delicious. When does one add the black pepper? Is it for the batter or for the glazed pecans? 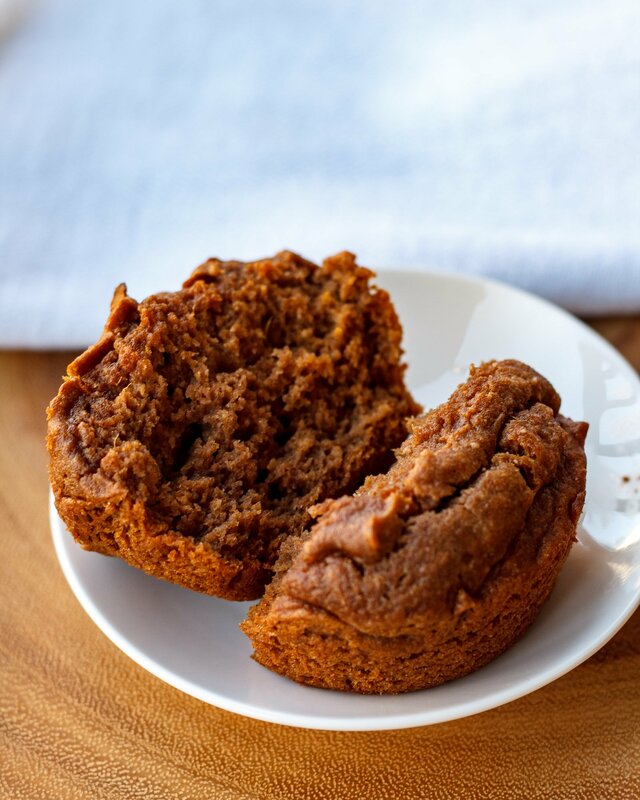 Oh, sweet potato teff muffin, where have you been all my life?! I love baking with teff flour. So glad I come across your blog, Lu. I’m pretty new to teff, so if you have a favorite teff recipe please do share! I need to go get my hands on some teff flour because I’ve been hearing so many great things about it. 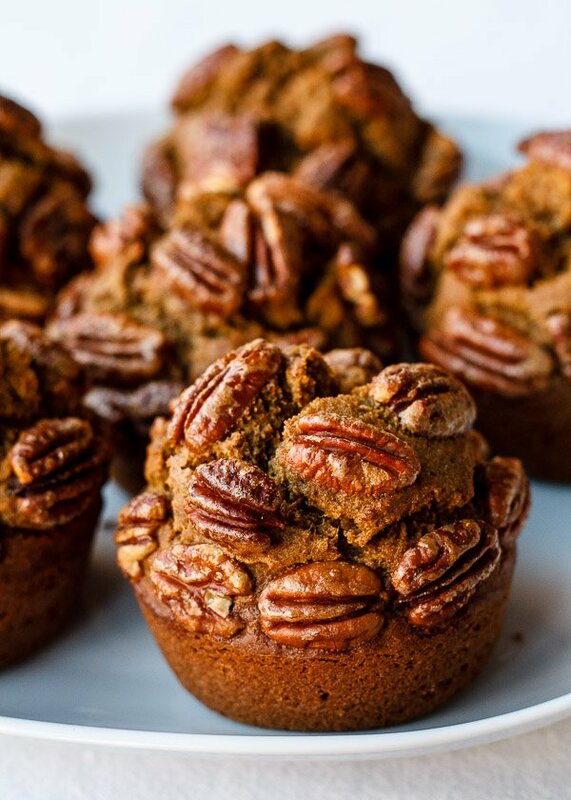 Lightly and naturally sweetened is my favorite way to go and those pecan tops are just so fun. Hope your trip was wonderful! Yeah! Let’s test different teff flour recipes together! OMG your photos of Athens on instagram look incredible, I am insanely jealous of your travels! So impressed that you have time to fit in some blog posts as well. Sweet potato is something that I really want to try in sweet baking sometime, so will have to give your muffins a go! It does seem to go really well with pecans and cinnamon – very holiday like haha.